Usually we make instant sweet appam with wheat flour / godhumai maavu inippu appam / wheat appam with banana for Ganesh Chaturthi, Gokulashtami and Karthigai deepam. It can be made with or without paniyaram pan. Being a calorie conscious women, I always make sweet appam in paniyaram pan to reduce oil consumption. But yesterday I purposefully tried this deep fried version to post it here. I made it with wheat flour, banana and jaggery asking the recipe from my MIL. It was awesome. I couldn’t resist myself stopping with one or two. My MIL usually make this appam using maida, banana and sugar for our guests as evening snacks. It comes out super soft, spongy and fluffy. We make this instant wheat flour appam on Ganesh chaturthi evening and offer Lord Ganesh. If you have the practice of offering appam for Vinayagar chaturthi, do try this one. 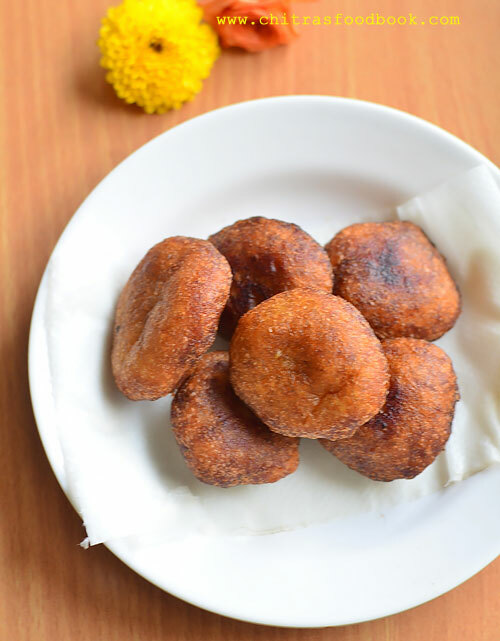 U will love its softness and taste.Ok, lets see how to make this sweet appam recipe using wheat flour, banana and jaggery with step by step pictures and video ! 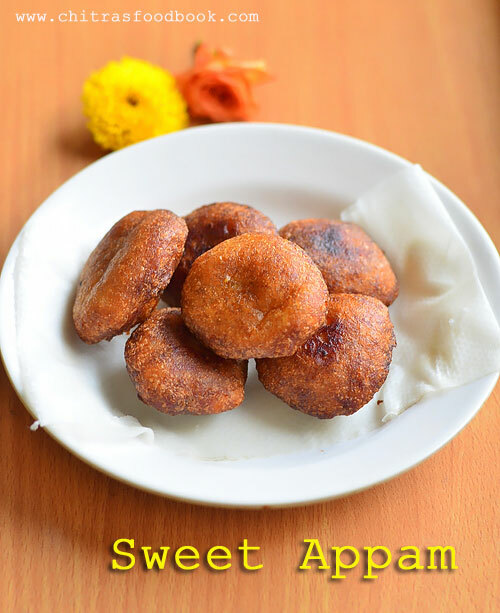 I have shown 2 methods in video - Deep fried appam without paniyaram pan and appam in paniyaram pan. In a wide bowl,take all the ingredients except oil and water. Mash the ripen banana and add to the flour. Add the required water and make a thick batter.The consistency of batter should be like thick idli batter. It should be pourable. Heat oil for deep frying.Use less oil to get a nice round shape.Take a small curved ladle and pour a ladleful full of batter.Make one or two at a time.Appam should rise slowly from the bottom to top.This is the correct heating point.It helps the appam to cook evenly.If the oil is very hot,appam will brown outside and it doesn’t get cooked internally.So keep the oil at right heating point.First check with a drop of batter and proceed further. Pour a small ladle of batter and splash the oil over the top of appam while it cooks. As soon as the color of appam turns golden brown, flip it and cook the other side till golden brown.Remove & drain in a tissue paper. You can also make this appam using paniyaram pan to use less oil. Please watch the video. I have shown in detail. Sweet appam is ready to serve.Enjoy ! For variations,u can add maida and sugar instead of wheat flour and jaggery. U can also make spicy version by adding finely chopped onions, ginger, curry leaves, coriander leaves & green chillies along with hing. It tastes great. Do not add more cooking soda.Less than a pinch would be enough.Adding more soda makes the appam absorb more oil. Banana gives a super soft,spongy texture to the appam.Never skip it. It stays soft and good for hours.So u can make them in advance too. 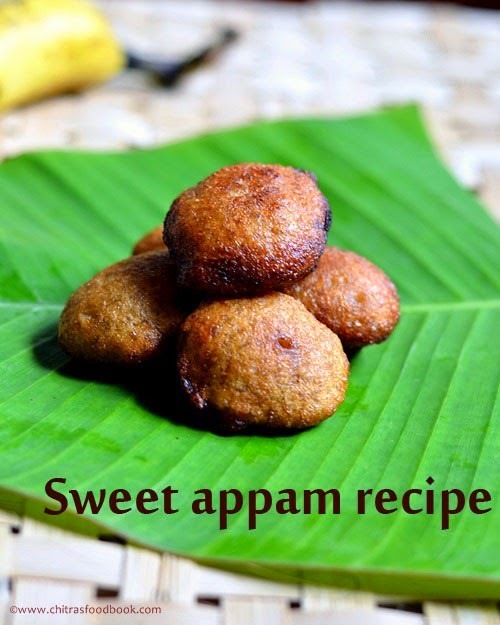 Make this super soft and delicious appam & offer GOD ! U forgot the jaggery in the ingredients section... How much jaggery do we need to use? Delicious snacks, love to munch some rite now. Greetings on Ganesh Chathurthi- we call these Cheeda. which kinda Banana's do we use?? Pachai vazhapazham.. or any variety? You can use fully ripe rasthali or poovazhai.Use one banana if its very small in size.